I bought Running, Jumping, Standing Still by “Spider” John Koerner & Willy Murphy in around 1970 or 1971. I have no idea what prompted me to buy it, I think it may have been one of those wonderful speculative purchases that becomes a treasure. It was on the turntable a lot. 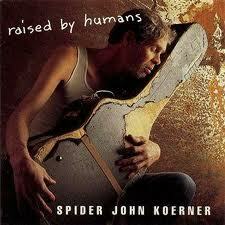 “Spider” John Koerner’s rendition of Santy Anno seems to be a hybrid of a number of versions of the song. It roots are either the Mexican-American War in the 1840’s … or the gold rush into California in 1849. “Spider’s” version merges them – rendering the lyric senseless from any historical or geographic perspective. But it is still a rollicking sea shanty – and who needs logical sense. The name of the song and its refrain comes from the Mexican General, Antonio Lopez de Santa Anna. In one battle he was pitched against Zach Taylor (who went on to become the 12th President of the USA). This battle took place near Monterrey (not Monterey). Taylor defeated Santa Anna. Different versions of the song include another US General – Scott. Scott led troops at Molina del Rey which appears in other versions of the song that have this slant. In 1849 roughly 300,000 people surged into California hoping to strike rich by finding gold. Half of them came by sea. Clearly General Santa Anna has nothing to do with this event. Stan Hugill – performer, artist, sea-music historian – suggests that the patron saint of Breton – Saint Anne is the source of inspiration of the song. Now, the lyric “Spider” sings has us – in the days of ’49 – leaving Liverpool, heading south, passing the Gulf of Mexico (ie passing the “plains of Mexico” where Generals Santa Anna & Taylor faced off, around Cape Horn up to Frisco Bay and then back down to Mexico. How does Santy Anno connect with Paths of Victory? At about the same time Bob Dylan was learning songs from Odetta’s album, he was knocking around, playing guitar with “Spider” John Koerner in Dinkytown (an area of Minneapolis). Koerner has been described as “a middle class Huck Finn intensely involved in music” and said himself that he and Bob “liked playing the same sort of guitar things”. With my newly learned repertoire, I then went further up the street and dropped into the Ten O’Clock Scholar, a Beat coffeehouse. I was looking for players with kindred spirits. The first guy I met in Minneapolis like me was sitting around in there. It was John Koerner and he also had an accoustic guitar with him. Koerner was tall and thin with a look of perpetual amusement on his face. We hit it off right away. … When he spoke he was soft spoken, but when he sang he became a field holler shouter. Koerner was an exciting singer, and we began playing a lot together. Odetta has also performed Santy Anno – although it is clearly the “Gold Rush” version with all the action happening in Californi-o. 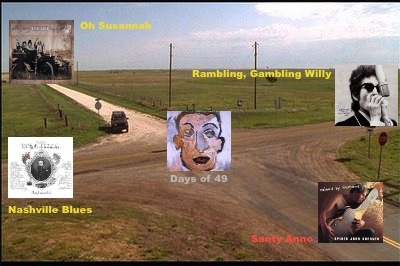 * Aweigh, Santy Ano by The Weavers – A great version as you’d expect from legends. Another about the gold rush. This one starts at Boston instead of Liverpool. * Santiano – Hugues Aufray & Tri Yann – in FRench with audience participation. * Songs of the Sea – a website compendium of sea tunes, lyrics and information. East: Running, Jumping, Stand Still by Spider John Koerner & Willy Murphy. West: Paths of Victory was our last port of call. In 1959, when he moved to Minneapolis Dylan swapped his electric guitar for an acoustic guitar – a Martin 00. He learnt all the songs from Odetta’s first solo album, Odetta Sings Ballads and Blues, which had been released in 1956. 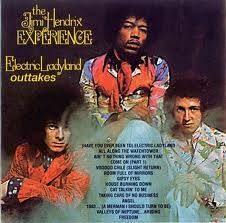 In fact it is said that he swapped from electric to acoustic after hearing this album. Odetta was a prominent figure – her stature reminds me somewhat of Paul Robeson – multi-talented and politically active. Martin Luther King Jnr called her the Queen of American Folk Music and Rosa Parks declared she was Odetta’s number 1 fan. I remember her clearly. A voice deep and resonant, appearance strong and striking. I remember an engaging smile revealing a perfect gap (I’m sure it was my Mum who told me that gapped teeth meant money would come your way). Unfortunately, in the early days the smile seemed rare, probably why it made an impression. But I also remember Odetta having a massive “afro” – yet I cannot find a single image that suggests this memory is accurate. Perhaps I have merged in my memories the images of Odetta and Angela Davis. Voice, deep & resonant. Appearance, powerful and striking. 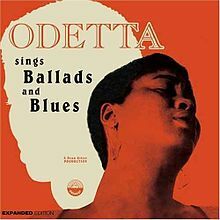 A short 6 years after Dylan’s guitar swap and getting Odetta’s songs “down pat”, Odetta released her 13th album – Odetta Sings Dylan. With her activism in the Civil Rights Movement and Dylan’s poignant songs of civil “protest”, you’d expect this album to be a political “cracker” … but the focus is not civil rights at all – it is more a love & war album. And in every 4 line verse the hard traveling times are overcome by thoughts & visions of better times. Dylan wrote this song in 1962, and performed it in his very first TV appearance – a show that include The Staples Singers, amongst others. 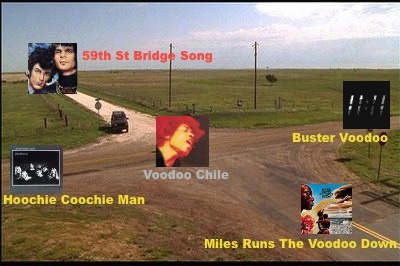 Paths of Victory didn’t appear on any Dylan recordings, until The Bootleg Series Vol. 1 and then again on Vol. 9 of the same series. There is also no record of it in any of the known playlists for Dylan concerts. 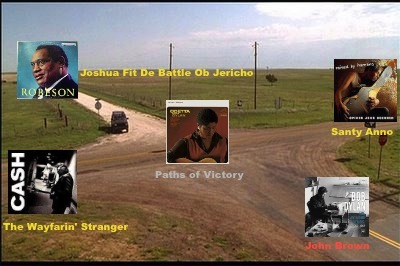 How does Paths of Victory connect with John Brown? Well … both were written by Bob Dylan, but that was not how I was thinking. It was more that Odetta was a big influence on Dylan who earned quickly his place in the annals of American folk and had the Queen of American Folk record an album of his songs. They also both performed at The March On Washington For Jobs And Freedom. * The Last Word– A New York Times interview. (19m 49s). Well worth the 20 minutes – you’ll hear that her age did not take the power from her voice. * The National Visionary Leadership Project – This link is the Visionary Project’s page on Odetta. It contains 8 video interviews with Odetta. The subjects of the interviews are Childhood; My Family Tree; Racial Climate; Education; Unique Style/Name; Acting in Movies/Plays; Qualities; Life As An Activist. 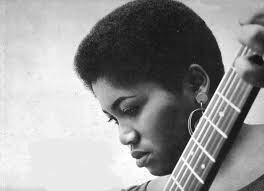 * There’s A Hole in The Bucket – this was Odetta’s first hit in the mid-50’s, a duet with Harry Belafonte. This performance is by the two of them during Belafonte’s 1960 Carnegie Hall concert. * Odetta – Soul Stirrer 1930-2008 – Time Magazine’s obituary. * Odetta, Voice of Civil Rights – New York Time obituary. 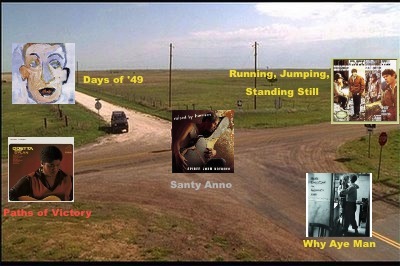 East: Santy Anno by Spider John Koerner. South: John Brown we met at the last cross road. West: The Wayfarin’ Stranger by Johnny Cash. 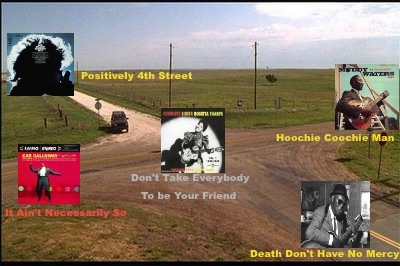 Well, here we are at the 10th intersection and Bob Dylan has only just arrived. There is no way I’d have picked John Brown would be the first Dylan contribution to this musical trail. But here you go. Dylan wrote this song in 1962, performed it in October 1962 at The Gaslight Cafe in New York … and then he put it away for many years. 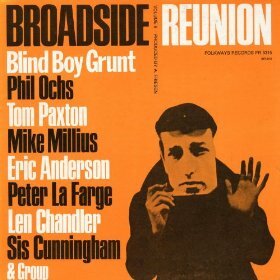 (Although he did record it for Broadside under the name Blind Boy Grunt – in fact it was Blind Boy’s recording debut). It was 1987 when Dylan toured with The Grateful Dead that John Brown saw the light of day again. An inauspicious period for Dylan, their tour was not well received. I first heard John Brown when I bought a second-hand copy of Dylan’s 1994 album MTV Unplugged – the only song on the album that I hadn’t heard before (though the other tracks had undergone some typical Dylan reinvention). 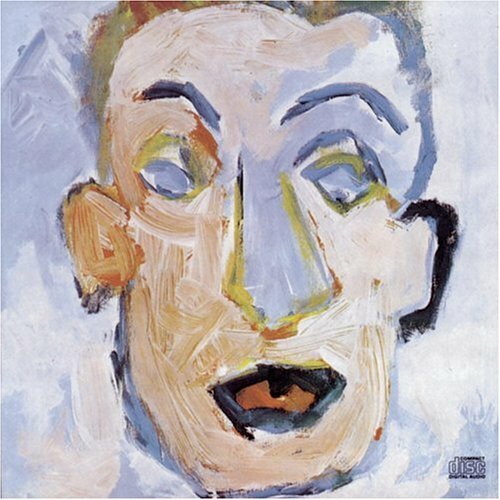 Then it appeared on The Bootleg Series Vol.9 – The Witmark Demos. Dylan stutters over one the verses but it’s just a stumble and he quickly recovers. It is likely Mrs McGrath an early 19th Century Irish folk song was the antecedent for Dylan’s John Brown lyrics. Both songs relate the tale of a mother sending her son off to war and the son returning … ravaged. The melody could be an adaptation of 900 Miles – a great traditional song sometimes credited to Woody Guthrie and performed by many over the years including (the links take you to the songs on You Tube) Odetta, Richie Havens, Terry Callier, & Bethany & Rufus (a nice little link – Bethany Yarrow is the daughter of Peter from Peter, Paul, & Mary). According to Robert Shelton, Roebuck “Pops” Staples – Mavis’ father – reckoned Dylan wrote John Brown for him. The Staples family had become tight with Dylan after Shelton introduced them at a gospel show in 1962. Dylan was right in the middle of one of his most creative periods when John Brown was written. 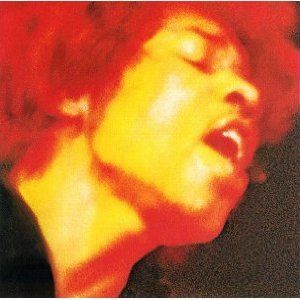 With the volume and quality of songs Dylan was churning out, it is not surprising this one was left behind for a long time. But it still bites … starting with a mother so proud of her son carrying a gun, hoping for medals to pin on her wall, and finishing with the son, hardly recognised and unable to talk, dropping those same medals into his mother’s hand. Between the maternal ambition and its sad realisation, John Brown moves through frightening physical impacts and eternal questions about futility, identity (his & his enemy’s), and who is in control … . Oh, and I thought when I was there, God, what am I doing here? And I saw that his face looked just like mine. How does John Brown connect with And The Band Played Waltzing Matilda? The damaged soldier returning home from battle. * Bob Dylan and The Grateful Dead – Live in 1987 – John Brown. This version sounds more like Keep Your Eyes On The Prize (or Keep Your Hand On The Plow, Gospel Plow, Hold On … one of those). East: We just heard it … And The Band Played Waltzing Matilda. 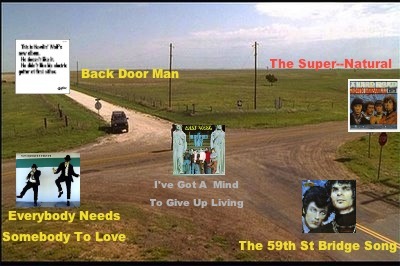 South: Mrs McGrath by Bruce Springsteen. 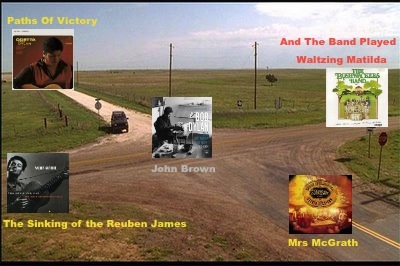 West: The Sinking Of The Reuben James by Woody Guthrie. Paul Butterfield had a profound influence on the development of contemporary blues and rock music. Unfortunately he died young – only 44 – in 1987. In the late fifties, while still in high school, he linked up with the older Nick Gravenites, and began playing some acoustic blues & folk together. They also started hanging around the blues clubs on Chicago’s South Side, an area avoided by most whites. There they were listening to and befriending some blues’ legends – often they would be the only two whites in the audience. Butterfield’s short stint at the University of Illinois and Gravenite’s regular commutes (and eventual move) west to San Francisco interrupted the partnership. Elvin Bishop had moved to Chicago to study Physics at the University of Illinois but dropped out to focus on an education in blues guitar. It wasn’t long before he stumbled across Paul Butterfield and they started playing together and with people like Muddy Waters, Sonny Boy Williamson (both of them – I & II), Buddy Guy, Junior Wells, & Howlin’ Wolf. Invited to play a regular spot at Big John’s on Chicago’s North Side, they nicked a couple of members of Howlin’ Wolf’s backing band – Jerome Arnold & Sam Lay – and thus the core of The Paul Butterfield Blues Band was formed. Just before they went into the studio to record their first album, Michael Bloomfield joined as a second lead guitar & Mark Naftalin on keyboards joined during those sessions. … and there you have it. Possibly the first multi-racial blues band in Chicago and certainly one of the most influential bands of the era. I Got A Mind To Give Up Living is from their second album East-West – Sam Lay had been replaced on drums by Billy Davenport. The connection with The Super-Natural? It’s the guitar … Peter Green (The Super-Natural) and Michael Bloomfield (I Got A Mind To Give Up Living) had very unique & individual styles but both were piercing, eloquent, and emotive. Whenever I listen to either … I always think that I should next listen to the other. Paul Butterfield also had an appearance with John Mayall’s Bluesbreakers and released a 4 song EP in 1967, the same year that Hard Road, the album with The Super-Natural, was released. And go shopping instead ..
* Live version of I Got A Mind To Give Up Living recorded in 1996 when the Butterfield Blues Band played The Unicorn in Boston. * Fleetwood Mac (Peter Green) performing the same song at The Warehouse in New Orleans. * Paul Butterfield appeared as a guest on the 1960’s TV show To Tell The Truth, where a panel aims to pick the guest from amongst a line-up. The panel’s questioning and judgement is followed by a sloppy performance of Born in Chicago – a song from their first album written by Nick Gravenites. * An 11 minute video produced to try and help generate votes for Paul Butterfield’s nomination to the Rock ‘n’ Roll Hall of Fame. * Another blog article about I Got A Mind To Give Up Living. This is from the website www.nodepression.com which concerns itself with the roots of american music. * Bloomfield, Arnold, & Lay were part of the band behind Dylan when he controversially plugged into the electric sound at the 1965 Newport Folk Festival. Al Kooper & Barry Goldberg were the other two members of that illustrious troupe. Your Choice For The Next Stop?